Reds, blues, and gold tones mingle together to create the beautiful Margaux collection by Croscill. This color combination airs a certain richness that can't be denied. The red background glows against the more muted tones of the chenille jacquard print. Coordinating throw pillows feature luxurious embellishments like tassels, and faux silk trimming. A beautiful tri-color cording finishes off the pieces nicely. Use the Margaux canopy valance to bring the look of the bed to the windows or try the contrasting jacquard of the drapery panels. A faux silk golden bedskirt with pleats will add extra dimension to the room. Croscill has been manufacturing high quality bedding at affordable prices for more than 50 years! The Margaux Collection by Croscill features a luxurious chenille damask jacquard. Deep tones of red and blue with accents of ornate gold add richness to the beautiful fabrics and intricate designs. Embellishments of embroidery, woven gimps, and tassel fringe further enhance the elegance of the collection. Both the comforter and shams are finished with a tri-color twist cord. The Bedskirt features a beautiful gold faux-silk. With its refined patterns and graceful accents, the Margaux Collection will transform your bedroom into an alluring retreat. One (1) Queen Comforter, two (2) Standard Shams, one (1) Bedskirt 15in drop, Comforter measures 92x96, polyester fabric and poly fiber fill, dry clean recommended, imported. Manufactured by Croscill. The Margaux Collection by Croscill features a luxurious chenille damask jacquard. 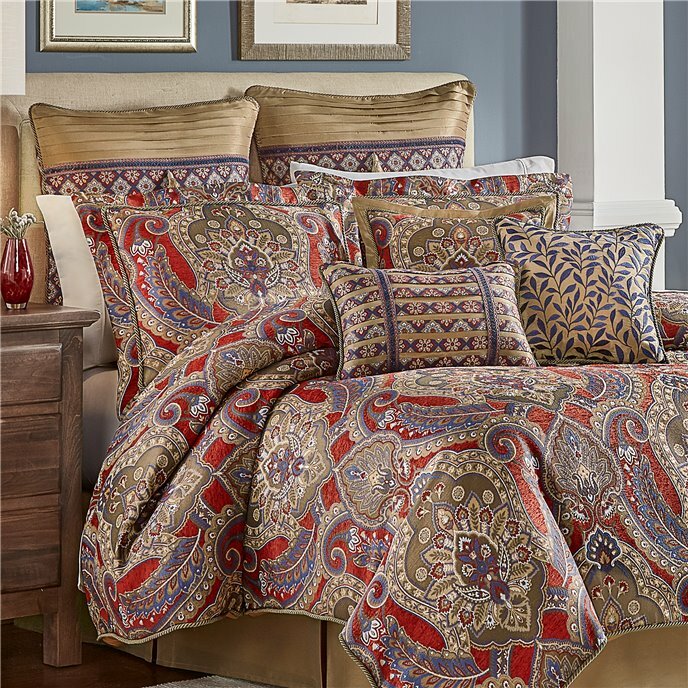 Deep tones of red and blue with accents of ornate gold add richness to the beautiful fabrics and intricate designs. Embellishments of embroidery, woven gimps, and tassel fringe further enhance the elegance of the collection. Both the comforter and shams are finished with a tri-color twist cord. The Bedskirt features a beautiful gold faux-silk. With its refined patterns and graceful accents, the Margaux Collection will transform your bedroom into an alluring retreat. One (1) Cal King Comforter, two (2) king shams, one (1) Bedskirt 15in drop, Comforter measures 110x96, polyester fabric and poly fiber fill, dry clean recommended, imported. Manufactured by Croscill. The Margaux Collection by Croscill features a luxurious chenille damask jacquard. Deep tones of red and blue with accents of ornate gold add richness to the beautiful fabrics and intricate designs. Embellishments of embroidery, woven gimps, and tassel fringe further enhance the elegance of the collection. Both the comforter and shams are finished with a tri-color twist cord. The Bedskirt features a beautiful gold faux-silk. With its refined patterns and graceful accents, the Margaux Collection will transform your bedroom into an alluring retreat. One (1) King Comforter, two (2) king shams, one (1) Bedskirt 15in drop, Comforter measures 110x96, polyester fabric and poly fiber fill, dry clean recommended, imported. Manufactured by Croscill. The Margaux Euro Sham features the faux-silk in a pleated presentation pieced with a luxurious chenille foulard jacquard. The sham reverses to the chenille foulard jacquard and is embellished with an elegant gimp, tassel and is trimmed in a delicate tri-color twist cord. One (1) European Sham, Measures 26x26, polyester fabric, spot clean recommended, imported. Manufactured by Croscill. The Margaux (19”x13”) Boudoir Pillow features a piecing of the beautiful gold faux-silk with the chenille foulard jacquard presented in a pleated design. The pillow is embellished with the gimp and reverses to the chenille foulard jacquard. One (1) Boudoir Pillow, Measures 19x13, polyester fabric and poly fiber fill, spot clean recommended, imported. Manufactured by Croscill. The Margaux (16”x16”) Fashion Pillow is constructed using the faux-silk with a beautifully designed embroidery embellishment. This pillow reverses to the faux-silk and is trimmed in a delicate twist cord. One (1) Fashion Pillow, Measures 16x16, polyester fabric and poly fiber fill, spot clean recommended, imported. Manufactured by Croscill. The Margaux (18”x18”) Square Pillow features the luxurious chenille damask jacquard centered on the face. This pillow is trimmed with a delicate twist cord, a faux-silk flange and reverses to the faux-silk. One (1) Square Pillow, Measures 18x18, polyester fabric and poly fiber fill, spot clean recommended, imported. Manufactured by Croscill. The Margaux Canopy Valance features the luxurious chenille damask jacquard. The valance is trimmed with the gold faux-silk and a tassel. One (1) Canopy Valance, Measures 54x19, polyester fabric, spot clean recommended, imported. Manufactured by Croscill. The Marguax Curtain Panel Pair features the chenille foulard jacquard with matching tiebacks. Each panel is lined with a solid white polyester lining and include encased weights in the bottom hem. Two (2) Window Panels, two (2) Tiebacks, Measures 82Wx84L, polyester fabric, dry clean recommended, imported. (2nd image shows with valance sold separately.) Manufactured by Croscill. The Marguax Curtain Panel Pair features the chenille foulard jacquard with matching tiebacks. Each panel is lined with a solid white polyester lining and include encased weights in the bottom hem. Two (2) Window Panels, two (2) Tiebacks, Measures 82Wx95L, polyester fabric, dry clean recommended, imported. (2nd image shows with valance sold separately.) Manufactured by Croscill.